My Friend Jen is having a baby boy any minute now, (she is possibly the cutest preggo I’ve ever seen)! She recently finished putting together the nursery for the baby, and its incredibly sweet, I had to share it with you! 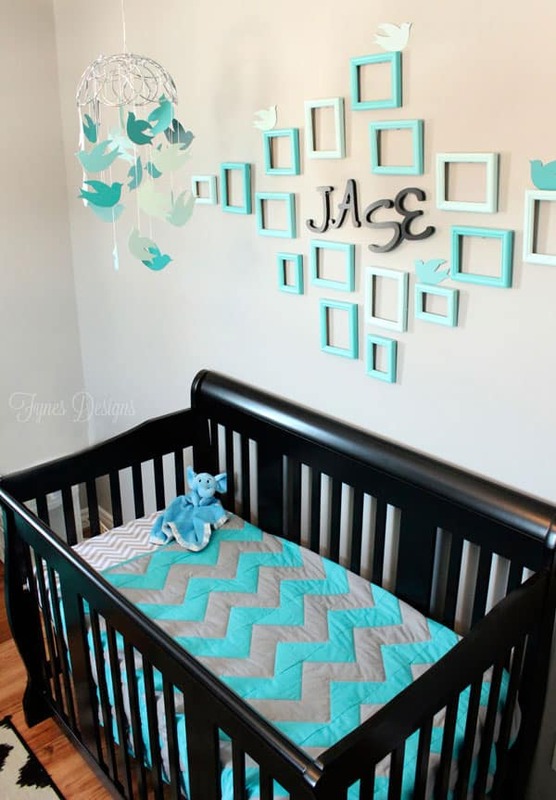 I can’t wait to hear the news of the arrival of their little one, he is one lucky boy with this fun baby boy nursery! The bold color combination Jennifer chose was perfect for this little room. 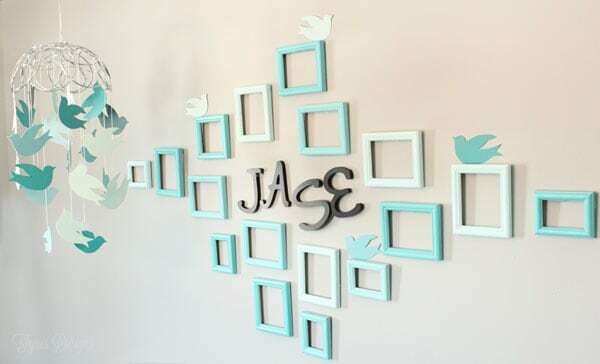 I love this unique focal wall, what an inexpensive idea, to tie in the baby’s name. Not to mention the fun birdie mobile she made from paint chips! 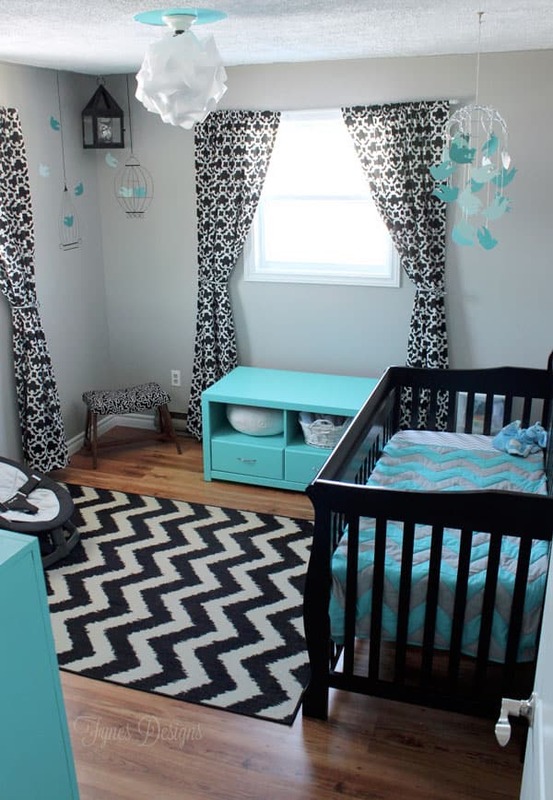 This baby nursery is coordinated 100%, not one stone was left unturned. The sentiment painted on small canvases is so sweet! Jase is already so lucky to have such loving parents and mom with great style! Thanks so very much to Jen for sharing her cute room with us today. She has such fabulous taste, it really shows throughout her entire house! I love that bird mobile! So awesome! 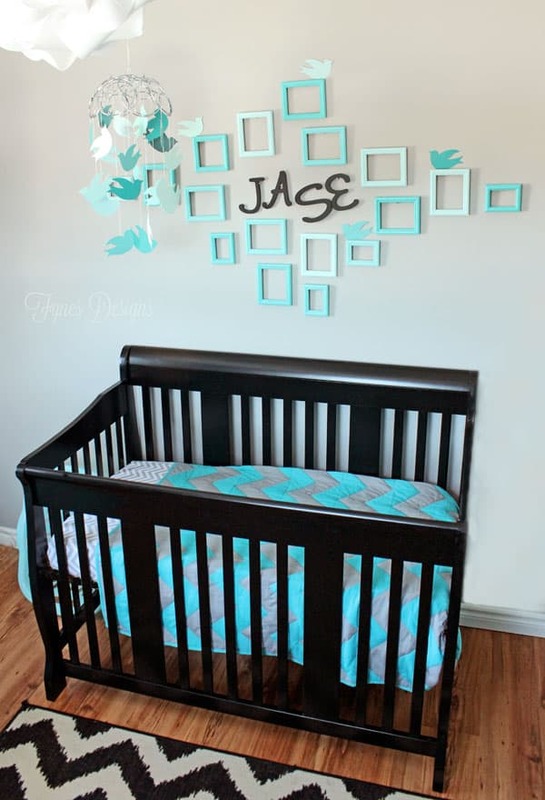 Such a sweet nursery- great color scheme!! I adore your nursery. I’m on baby number three and have never truly decorated the nursery. Might need to change that with this next one! Thanks for stopping by Meredith! 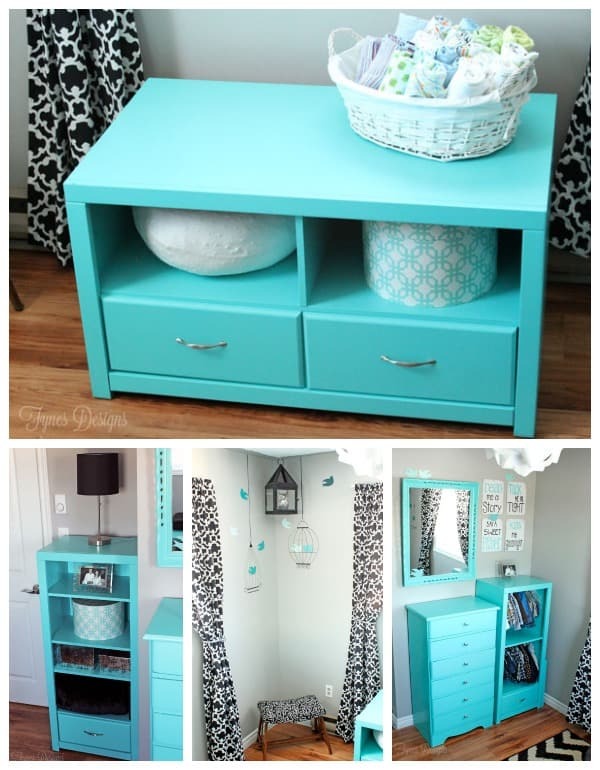 I adore this baby room. Is there any way to find out where Jen found the bedding for this room? I would like to buy it. Thank you. Unfortunately for you the baby’s grandmother made the bedding for him, sorry! I have been searching for a baby crib comforter just like that if anyone knows where I can find it please email me at mollyanne3@hotmail.com!! Any leads welcome. My best friend is having her first baby and she needs this to complete her nursery!! I am having a little girl & just love the open frames behind the crib. What sizes of frames did you use? Also, how many of each size did you use? We are naming our daughter Myna. The frames are 4×6 and 3×5, there are about 20 of them. The frames are from the dollar store, good luck! And congrats on your little one! That mobile is amazing – what template did you use to create the bird outline? 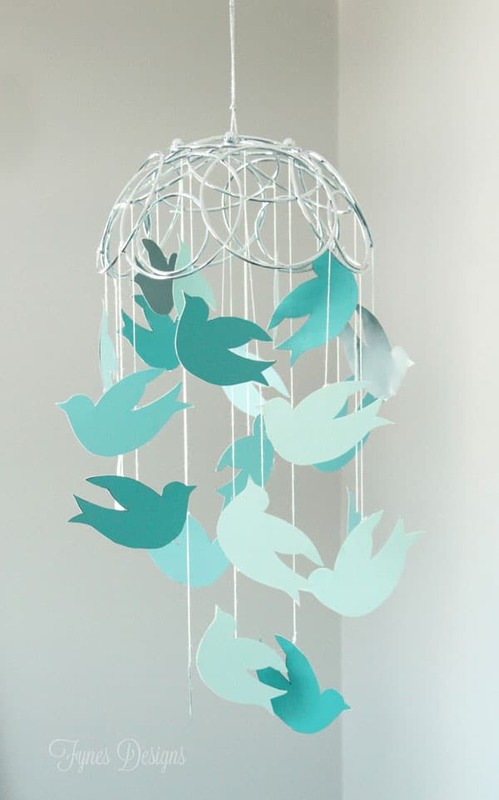 I’d like to tackle the project for an upcoming baby shower but haven’t been able to find a simple bird outline. I’ve been looking all over the internet for nursery inspiration. This is, by far, my favorite. What a cute room! Love that mobile she made! Thanks for sharing at the #HomeMattersParty – hope to see you again next week! What color blue did she use and brand! Love the shade of blue. I’m having a baby boy and fell in love with the blue!